No one has all the answers all the time, but you can find most of them with the marketing research process. 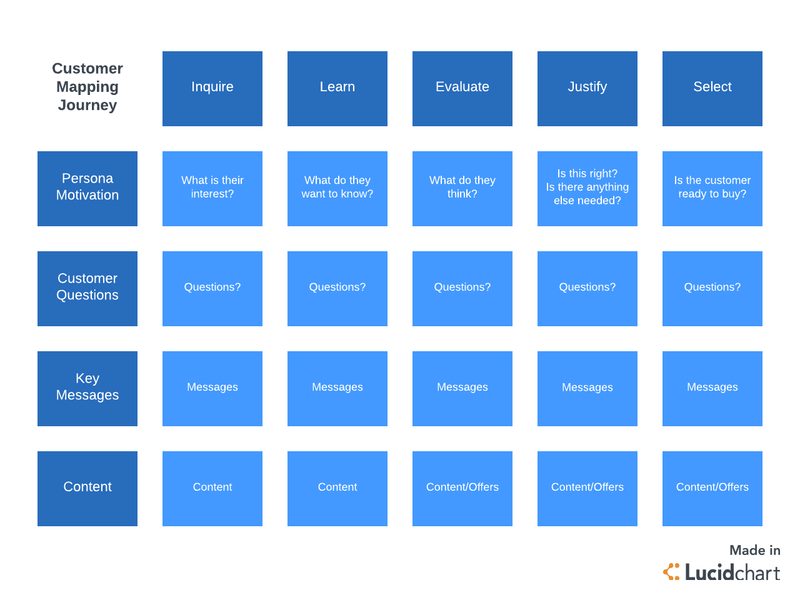 This process provides a simple way to get the information you need to address any problem. Here’s how you can research your way to marketing success. What is the marketing research process? The marketing research process is a series of steps used to plan and conduct relevant and informative research for marketing purposes. This process starts before the research ever begins, and it covers everything needed to make research effective, from planning to conducting to analyzing—all the way to finally presenting the results. This process increases the chance of success from your marketing efforts, as research allows for more informed decision-making and strategizing. For example, it can help you better understand your customers and their needs, thus helping you create a more impactful marketing plan. As much as we might want to believe our instincts are always right, that’s simply not the case. Research may back up your gut feeling, but it often reveals new, unexpected facts as well. The marketing research process helps you get all the information you need to make and justify a choice. There are five basic steps to the marketing research process, each designed to ensure useful research. The specific execution of these steps will vary based on your company’s specific needs and capabilities, but the outline below provides a good starting point. In this initial step, determine why you need to conduct research in the first place. Once you’ve defined why you need research, decide what kind of information you need and how your team will use that information. This will make it easy to design an appropriate research plan in the next step. This first step is also a good time to consult with decision-makers in your company. You’ll want to be sure that your marketing research adequately addresses their concerns and gives them the information they need to make a decision. Consult with them to determine any specific metrics they’ll use to make their decision so you can tailor your research process to include their needs. Next, begin developing your research approach. Develop a hypothesis, and then determine how you will conduct research. There are many ways to gather data, including surveys and focus groups, so it’s important to choose a method that will give you the information you need from the people you care about. Once you’ve decided upon your method, detail your research procedures. These procedures will include who conducts the research, who will be in your research sample, how you will incentivize your sample to participate, and when the research will be conducted. Create questions for your sample group, and consider testing these questions on a smaller group first to ensure that your questions are well-designed and fruitful. With a research plan in place, you can begin conducting your research. As you do so, ensure that everyone involved in collecting data has received training to do so effectively. You’ll want to supervise and evaluate their efforts throughout the research process to ensure you get quality data. Make sure to collect and record data in a secure place, preferably using a standardized format, to ensure you have accurate, usable data. As your research concludes, begin data analysis. This step includes editing, coding, or transcribing data as needed to make it readable and manipulatable. Data analysis can take many forms, but it often includes making graphs and tables to spot trends. Remember, your analysis should reveal whether your hypothesis established in step two was correct. The marketing research process concludes with a presentation of your research. Generally, this takes the form of a written report that includes the initial problem, an outline of the research, and recommendations for how to proceed. This step can also take the form of oral reports or presentations—anything that communicates your research clearly. However you present this information, make your report clear and understandable for any individuals who weren’t directly involved in the research process. Give them all the information necessary for decision-making. At this point, your company can take action based on your findings, thus concluding the marketing research process. One size does not fit all when it comes to the marketing research process. While the basic steps are applicable to most organizations, they will often be executed very differently. Your organization needs to personalize your process, and Lucidchart makes it easy to do so. For example, the formality of the marketing research process varies from company to company. Smaller businesses might conduct casual research with a Google survey. A large company, however, might require carefully selected focus groups and formal questionnaires. 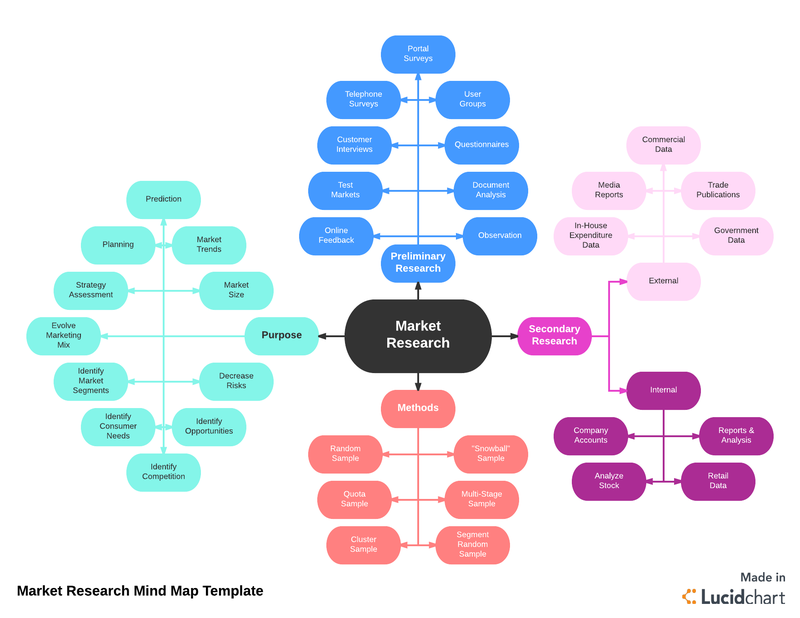 With Lucidchart, you can customize your marketing research process to fit your organization’s needs. Marketing research can play a key role in making the right decisions for your company. Developing your own marketing research process will help you achieve even better results from your data collection and analysis, in turn helping you make more informed choices. Sign up for Lucidchart, and define your marketing research process today!